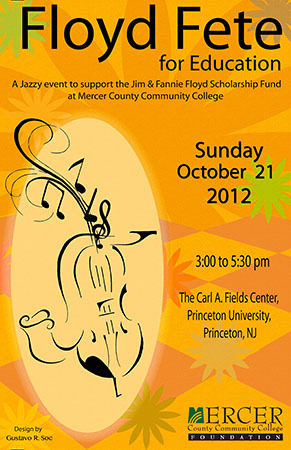 West Windsor, N.J. - It was Jim Floyd’s day on Oct. 16, as 125 friends, family and other supporters gathered for the third annual “Floyd Fete for Education,” hosted by the Mercer County Community College (MCCC) Foundation at Princeton University’s Carl A. Fields Center. 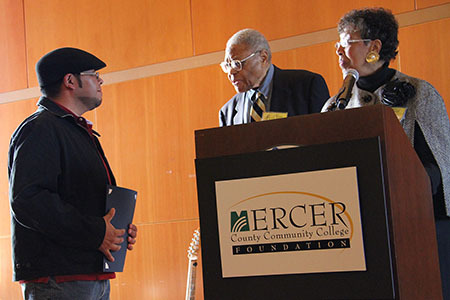 Against a backdrop of jazz music provided by a quartet of MCCC Music students and alumni, the college paid homage to a man who has served on the college's Foundation Board for more than 30 years and has made education and social justice the cornerstones of his civic endeavors. Co-chairing the event was Shirley Satterfield and Foundation Board member Bob Humes. In her welcome remarks, Satterfield said, “This scholarship is crucial to students whose education would not be possible without this support. Thank you, Jim, for lending your good name to this event.” This year's Floyd Fete raised $30,000, which will be added to the fund's $118,000 total that has resulted in a permanent endowed scholarship. Princeton Borough Mayor Yina Moore paid particular tribute to the late Fannie Floyd, whose special charitable focus was programs that benefited young people, including the YMCA and YWCA and other youth programs. “The spirit of Mrs. Floyd is truly behind this effort,” Moore said. 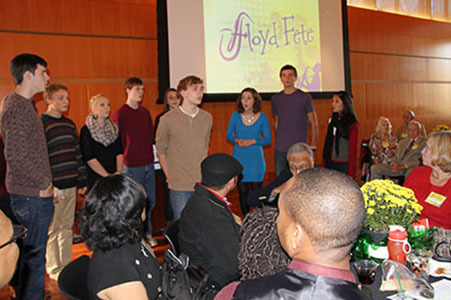 When Mr. Floyd himself addressed the audience, his sense of purpose was evident. Scheduled for minor surgery just days before the event, he was assured by his medical team that he would be able to attend. “I was not going to miss it,” he said. Floyd added that he has been impressed with the drive and dedication of both recipients of the Floyd Scholarship. The 2011 awardee was Gwendolyn Alexander, an adult returning student majoring in Funeral Service, and Erika Morillo is this year’s recipient. Morillo, of Hamilton, attended Floyd Fete with members of her family, including her mother and 3-year-old son. She described the awarding of the scholarship as “a pivotal moment that has allowed me to pursue my degree full time.” Morillo enrolled as a part-time student in spring 2011, working during the day and attending classes at night. Majoring in Advertising/Graphic Design, she says Mercer is giving her the tools she needs for her portfolio. Morillo plans to graduate this spring and will transfer to a four-year art school. Winner of the poster design contest for the event was Gustavo Soc. 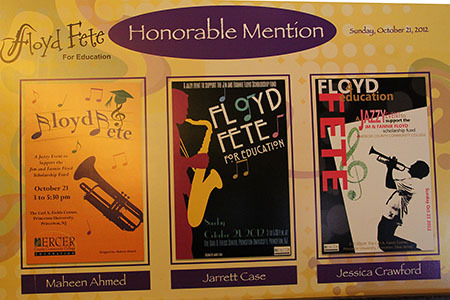 Three other posters, designed by Jessica Crawford, Jarrett Case, and Maheen Ahmed, received honorable mentions. MCCC faculty member Joan Goldstein noted that the Floyd Scholarship reflects the desire to provide a helping hand that can make a lasting difference. "In each of our lives, we have gotten help at points when we needed it. We want to do the same." 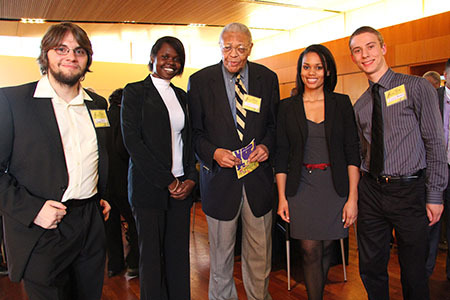 Prior to the event, Goldstein, the host of the Princeton TV30 program "Back Story with Joan Goldstein," featured Mr. Floyd, Bob Humes and the 2011 recipient, Gwen Alexander. Her video can be viewed here. Other highlights of the day included a performance by "Around Eight," an a capella group from Princeton High School and several numbers performed by Minister William D. Carter III, accompanied by two other musicians. 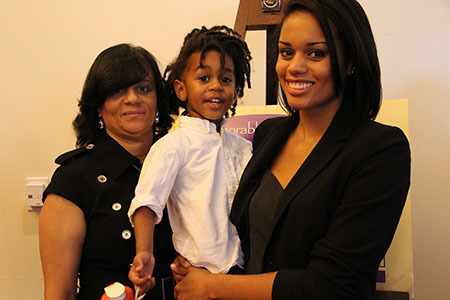 Scholarship recipient Erika Morillo, right, attended the event with family members including her son and mother. 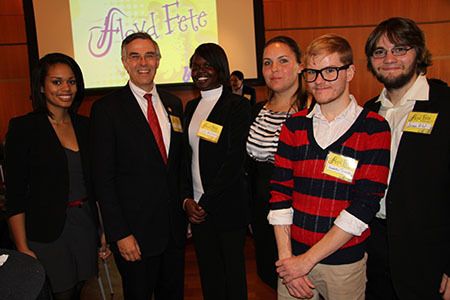 Jim Floyd, center, is pictured with students, from left, James Reslier-Wells, Jos Mathiang, scholarship recipient Erika Morillo and Anderson Monken. 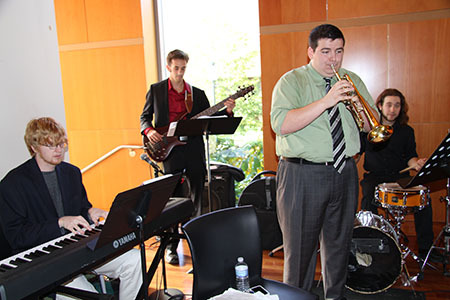 MCCC musicians included Dan Povio on trumpet, Kurt Moreton on piano, Ben Russert on bass guitar and Sean Christiansen on drums. 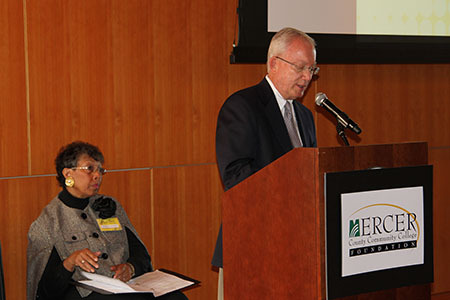 Fete Co-Chairs Bob Humes and Shirley Satterfield addressed the crowd. U.S. Congressman Rush Holt, second from left, is pictured with students Erika Morillo, Jos Mathiang, staff member Tatiana Dodge, and students Alex Thomas and James Reslier-Wells. 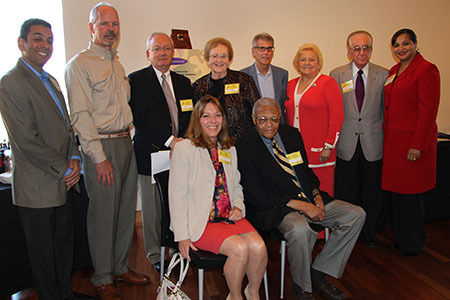 Among the guests were Foundation Board Chair Karen Kennedy with Jim Floyd (seated), and standing from left, Foundation Board members Ehab Abousabe, Scott Needham, Bob Humes, HelenMarie Dolton, Board of Trustees Chair Mark Matzen, MCCC President Patricia Donohue, Foundation Board member Joseph Ridolfi, and VP for College Advancement Mellissia Zanjani. Jim Floyd presents an award to student Gustavo Soc, the designer of this year's winning Floyd Fete poster. The winning poster design was by Advertising Design major Gustavo Soc. "Around Eight," the Princeton High School a capella group, performed several numbers before the appreciative crowd. 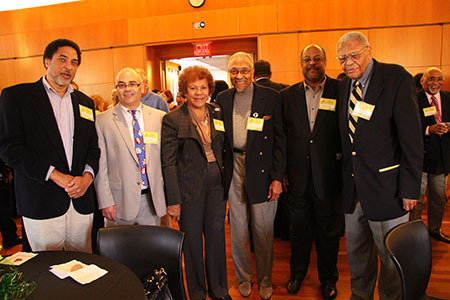 Mr. Floyd (far right) was joined by a host of friends, family and those he has worked with on civic projects over the years. Pictured with Jim, are, from left, Jim Floyd Jr., N.J. Assemblyman Reed Gusciora, N.J. State Senator Shirley Turner, Jim's brother, Sam, and his son, Michael. Poster designs that received Honorable Mentions were also displayed. 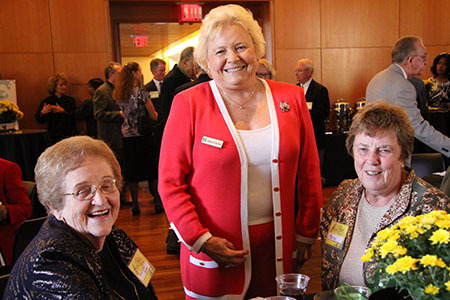 President Donohue, center, with Professor Emerita HelenMarie Dolton, left, and retiree Marcy Beck.